UPDATED: Fri., Feb. 8, 2019, 9:36 p.m. While snow blanketed nearly the entire Pacific Northwest region Friday, snow totals came out much lower than originally anticipated. The National Weather Service revised its weekend forecast for Spokane, lowering accumulation totals to 2 to 4 inches through Saturday. Earlier, the forecast had suggested much as 6 inches. After steady snowfall Friday morning it had mostly tapered off during the afternoon, but was forecast to pick back up later in the evening, but again wind back down before sunrise Saturday. Problems are more likely to arise when heavy winds sweep in Saturday morning. Winds with gusts up to 32 mph are forecast in parts of Spokane. Besides drifting snow, wind chills are expected to reach zero to minus-6 degrees Sunday. The high temperature will be in the midteens Saturday. That’s down from the mid-20s on Friday. The city initiated a full-city plow procedure, according to a news release Friday. Plowing started at 5:30 p.m. and will continue around the clock until every street is plowed. The full-city plow will take about three days, but could be longer, depending on additional waves of snow. From 50 to 60 pieces of plowing equipment will be used, according to Marlene Feist, spokesperson for the city of Spokane. The city is asking that cars be parked on the odd side of the street to ease plowing. The city’s website has a live map of streets that have been plowed and that are scheduled to be plowed. Click here to view the map. “Crews in all four road districts began applying liquid de-icer Thursday afternoon and since then, they have been working around the clock with snow plows, graders, and sanding/de-icing trucks,” wrote Martha Lou Wheatley-Billeter, spokesperson for Spokane County, in a news release. Gov. Jay Inslee declared a state of emergency Friday afternoon allowing the state military department to activate emergency response procedures and coordinate resources as needed. As part of the declaration, drivers of commercial vehicles collecting and delivering milk products and de-icing road salt to areas impacted by mountain passes or dangerous road conditions are exempt from regulations on how many hours they can drive. 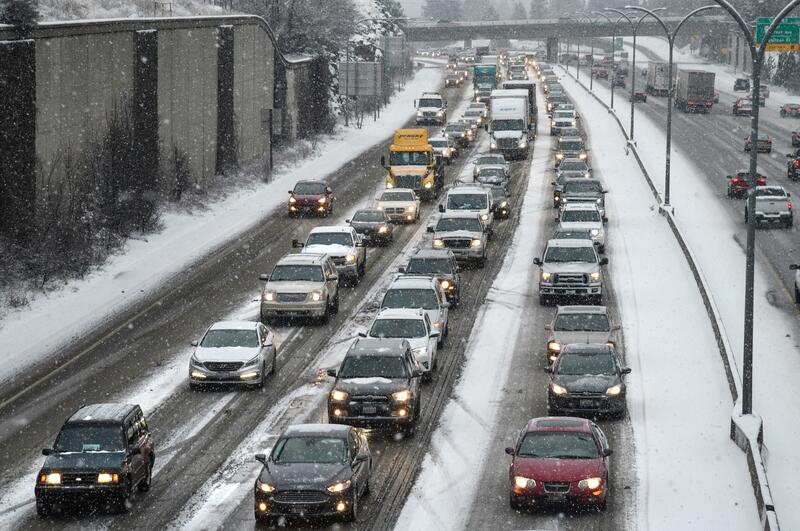 “I ask that motor carriers for the bulk milk and de-icing road salt industries to use their best judgment in operating under this exemption in a manner that ensures public health and safety,” Inslee declared. With limited storage capacity and the shelf life of milk supplies and delivery of de-icing road salt critical to maintaining safe travel on highways and streets, Inslee considered the delivery of such items essential. In Seattle, the forecast also was downgraded after residents cleared grocery store shelves in preparation for a potentially disastrous storm. Updated forecasts Friday evening dropped snow accumulation totals to 4 to 6 inches, but some areas such as the northern Olympic Peninsula had already seen up to 8 inches of snow by 3 p.m., reported the Seattle Times. SeaTac International Airport saw at least 213 flights canceled through the course of the day Friday and another 213 delayed, according to the Seattle Times. Even as snow total forecasts dropped, many Pacific Northwest residents continued to feel the impact of the weekend storm as the Seattle Times reported 1,540 Puget Sound Energy customers had lost power in Issaquah, with more outages reported in Renton, Auburn and Redmond. Published: Feb. 8, 2019, 7:33 a.m. Updated: Feb. 8, 2019, 9:36 p.m.